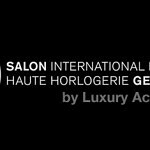 Timepiece lovers start well the year thanks to the SIHH in Geneva. In deed, Christmas is still not far away and we can already keep dreaming of amazing creations by Cartier, Piaget, Montblanc or Roger Dubuis among others. Here are some highlights of what you will be able to discover next week. Some Brands play the Skeleton concept in showing as much as they can the mouvement inside. This exercise is basically using a almost non-existing dial with a transparent back. In the case of Cartier, the entire 9611 mouvement was developed on this purpose. The Bridges were made in the shape of Roman numbers, so it serves the purpose of the dial. The result is a magnificent aspect of technicity and design. For the 2014 SIHH, Cartier will reveal a new rework of the Tank MC Skeleton. This time the entire timepiece will be presented in Pink Gold. Every single detail of this timepiece is purely beautiful. The Pink Gold usage gives a soften and perhaps more feminine touch to this timepiece. Last year the Palladium version was definitely more masculine. 20 jewels / 138 components / 28800 alt / h / 3 days power reserve. When Montblanc launched the TimeWalker range in 2004, the Brand wished to propose a very elegant, yet innovative and modern chronograph. Now 10 years later, Montblanc stays true to the TimeWalker DNA with this new version. The most striking characteristic is the treatment of the case. Done in Diamond-Like-Carbon (DLC) Black 4, it procures an extreme resistance to the steel and a very subtle black mate look. The high-tech bracelet is also a very interesting innovation that has a special treatment to increase resistance. A few days before the start of 2014 SIHH, Jaeger LeCoultre revealed the 11th opus of its range called Hybris Mechanica. As usual, they surprise us with an astonishing Grande complication, tourbillon, with only 7.9mm thick! Amazing watch-making mastery. To accomplish this masterpiece, not less than 8 patents were necessary (6 are new). 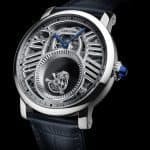 It has a new ultra efficient spiral, a system of automatic winding device, a retractable push mono-button and finally a new minute repeater with a reducing downtime system. This movement is equipped with a flying tourbillon with a balance wheel, a world premiere which offers full visibility on the balance and the spring. 41mm 18ct White gold case. 7.9mm thickness. There are Timepieces that go beyond the watch-making. They are purely pieces of art in which only the expert collector will give all its credits. And this one is exactly the translation of this exceptional work. Launched in 2006, Vacheron Constantin completes its Excellence Platine collection with a new timepiece. With its distinctive Tonneau case look, the Malte Tourbillon Collection Excellence Platine is one in a kind. The entire case and dial are made in the precious metal. The dial has a sand-treatment that brings a contrast with the hours/minutes indication. On the center bottom part of the dial, we can see the tourbillon that also carries the seconds hand. It is a magnificent work between classicism and contemporary design. Very limited edition of 50 units only worldwide. One year ago, Greubel Forsey presented its Tourbillon 24 seconds Contemporain. This year they will reveal a new version with an original Royal Blue Titanium movement. 2 variants: Red Gold and Grey Gold. The entire originality of this timepiece comes from the balance and the distribution in space of every single element, from the front dial to the back-case. Some elements like the power reserve presents a darker color, pushing further a contrast design. Many more other new creations will be revealed during this new SIHH that is just starting. 2014 will be a great year for Swiss Watch-making. More information to come. Info sourced at all brands pre-SIHH releases. All content is copyrighted with no reproduction rights available.